He fades out on the ride home. It is later than he thought and the bus is crowded, but he is alone. His mind drifts from the dirty jokes of the boys opposite, from the immobilising sweetness of a girl’s perfume, from the condensation on the windows, and the wet streets repeating behind them, and comes to rest in the emptiness of the sky. There is the sensation of rolling, a gentle, undulating motion, but nothing more. Time passes. He snaps back into consciousness, and finds his jaw is going. At home he closes his curtains, turns on his computer. The whir as the machine readies itself unnerves him; he sees images of gears and cogs, arcane machinery receding into dark depths. He feels pulled down into the hallucination; the picture morphs, melts; suddenly he is travelling through the pathways of his own brain, an electrical current sparking along synapses, burning them up as it passes, coiled hairs crackling over a bonfire in the night. He shakes his head. He should try to sleep soon, though he knows it is not time yet. Now is that hard stretch of time when existence has a physical form, when its dimensions can be felt, its choking weight, stretching dull and blank into an interminable future. There is too much existence. He decides to play a videogame. He has not been playing games recently — their guns, their machismo, their endless, hollow grind, has begun to feel inane to him — but now, drained yet awake, his mind floating back from a distant place, he has a need to play. 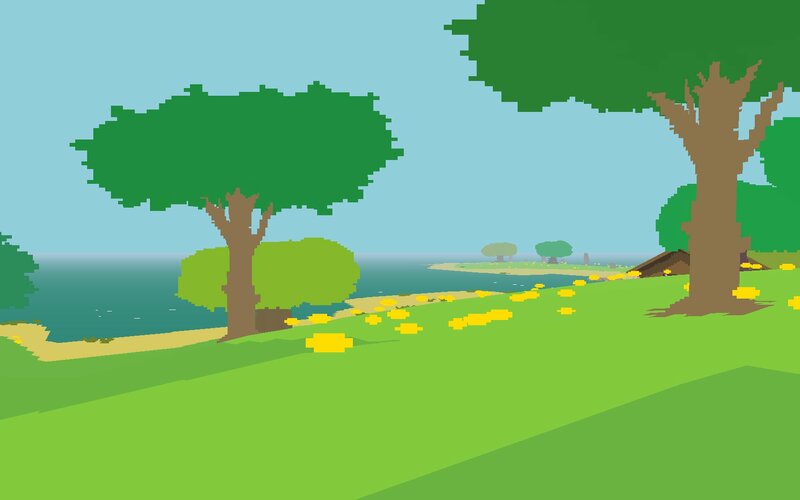 What he plays is a game called Proteus. 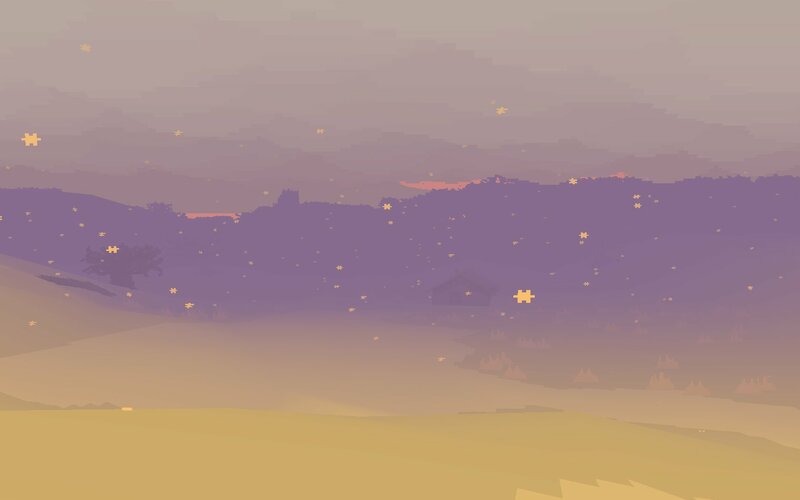 It is a short game about music and exploration, a cool breeze, a digital world he knows will envelop him — and he needs to be enveloped, before the voice that is beginning to rise back behind his thoughts, the cold voice he had heard so stark and fundamental last night, has a chance to take hold. He clicks the icon for Proteus. He goes in. He awakes in water. An island stretches from the mist before him. It is pixelated, pastoral. He wades to the shore, hearing only the sound of the water. It is a clear, pure sound, majestic in its totality. On land a song begins to build in his ears. Everything in this world has its own tune — the trees, the clouds, the Earth itself. He stands and lets the island’s chorus wash over him. He makes his way inland. Up from the shore he finds a small creature resting amongst the flowers. Startled by his approaching figure, the creature springs away into the undergrowth: Bip, bop, boop. He stops by a tree. Blossom falls to the ground. He finds it is almost sensuous, how the blossom falls, how delicately it lands upon the grass. It has that way about it, he thinks, the acceptance, the loss of resistance. He continues on. There are no people on the island, no objectives. Only an ever-changing symphony of meadows, flowers, rocks, sea and sky. He finds a path and follows it. The path leads him up a mountain. He stands at the summit and watches cloud banks roll in beneath him. The clouds nestle into the contours of the land, blanketing the world in a soft-hued fog. Peaks jut from the clouds in the distance. The wind whistles about him. The sun begins to set. Light retreats from the world, leaving the sky cool and dark and alone. Stars come out. The moon rises. He walks to a cliff top above a little cove and follows it round, watching the moonlight on the waves below. He descends through dense woods, feeling solitary yet protected. Eventually the woods open out onto a beach, quiet in the night air. There are rain clouds. 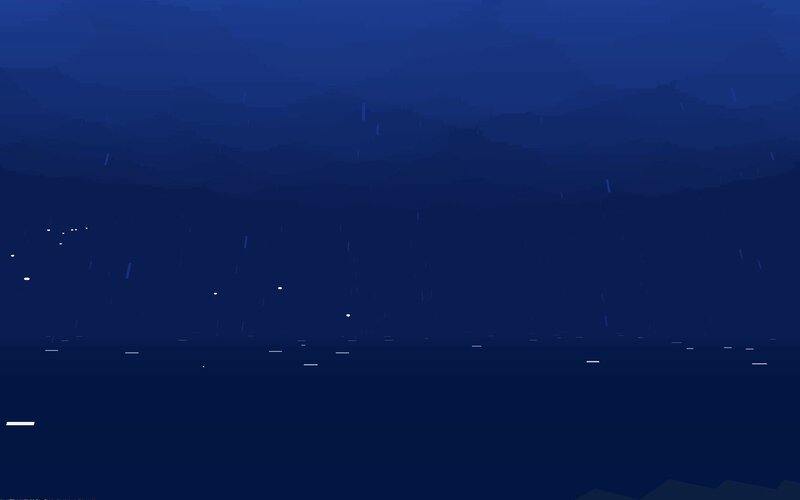 The rain falls across the ocean. He listens to the raindrops as they patter into the sea. He remembers the anxiety in the club, waiting to come up. How the faux leather seats in the booth had been sticky, how they had smelt of beer. He remembers looking at the faces of the people he was with, faces he knew but did not know, and feeling that they were on the other side of a great chasm, a silent expanse he could not cross. The dance floor had been filled with beautiful people. He had looked at them and wondered where they came from, what force propelled them, how they could glide through life so effortlessly, the thing that held him down passing over them unnoticed. On the edge of the dance floor a girl had spoken and he had turned around, but the girl had not been speaking to him, and he had felt a chill, and he had known then that he was not going to get high. But then later, at the bar, after the first rush had taken him, he had felt like liquid, felt smooth, like he was washing away, and he had decided it would be OK. The bartender had had one iris darker than the other and he had joked with him, how the gin was the bad gin not the good gin, and he had said next time a water, his jaw going a little, and the bartender had smiled because he knew, and everything had been fine, had smudged nicely. But a few minutes later the wave had already broken, and he had found himself in a cubicle, his back to the door, listening for bouncers, reaching for his key. He had looked down and seen the urine on the floor, had felt the cold you often feel in toilets, and he had realised that all barriers had been destroyed. He had been naked, alone, alert to the truth, to the realisation he could not escape from. He always felt it, usually dull, hidden just out of sight, but now it was right before him. A kind of dread, a loathing of life. Nothing was enough. All would die; all would cease to be. In his altered state the everyday aspects of his personality had been stripped from him, and all that was left was the singular truth: he had no home in reality. Life was cold, chaotic, and utterly repugnant in its ordinariness, its blatant mundanity. So he had done then what he always did, which was to run. He had drowned the realisation in alcohol, burned it with chemicals, trying to obliterate it, and everything else along with it. He had forced himself into the rush, charging headlong down a corridor between the stars. Smoke and lasers and twisting nothing, thrashing nothing. Faster. Coming, arriving, dancing. Lost. A bassline, a light shining through his beer bottle, a moment of tranquillity, of silence — then faster, powder, keys, drink; faster and faster, arriving, arriving; I do not know where I belong; arriving, faster, faster; I am lost; I am lost. 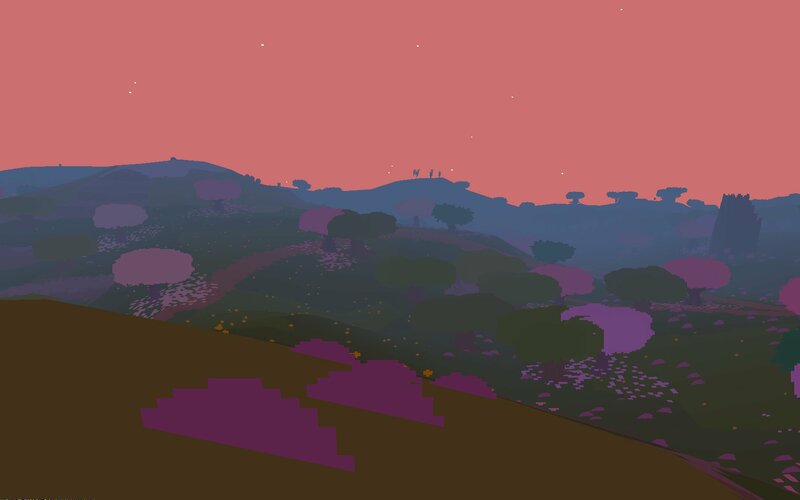 In Proteus, the first light climbs lazily from its slumber behind the world, and a new day begins. He sets off to roam the valleys of spring. Wind buffets the trees. Insects chirp in the bush. A ring of trumpet-like flowers sway and honk in the dawn. When he gets close the flowers yelp and dart back into the ground. He walks on and on. Seasons whirl. Summer arrives. Toadstools grow in the valleys, bees hum beneath the trees. The air is thick with the chatter of life, voluminous and swollen. The sun blazes down. He looks up and feels the sun’s embrace, feels how it is boundless, yet indifferent also. The sky turns coral, then magenta, then amethyst. An owl glides through the night, settling noiselessly in a distant tree. A shooting star streaks across the firmament above, aflame for one precious moment, then is gone. Autumn is sombre, reposeful. The oranges and reds deepen. He watches a single tree for many minutes, its branches a silhouette against the sky, its leaves falling with an elegiac beauty. The tree’s lament, the waiting ground, the mournful arc of the moon overhead, swells something within him, and tears come to his eyes. He heads down to the ocean once more. Always he is drawn to the sea. As he stands there a silence builds in his ears. It is not a silence of the world, but rather behind the world. It is a silence, he realises, within himself. Then comes the hard, crystalline charm of winter. Snow draws the world in, mutes its sounds. Everything is close, celestial, sacred. He walks across the transformed land and out onto the frozen sea, and snowflakes fall from the heavens. The snowflakes fall and fall. They fall past his eyes, through his body; they touch nothing; they fall forever. He walks into the snowflakes and he listens to the music emanating from all manifested things — and to the silence behind them, the silence from which the notes are born. The notes and the silence. They go together, he sees. The music is not just the notes, but the silence also. Two sides forming with their union a great and impenetrable song — a song of cycles, of death and rebirth, of flux. It is a song of awareness. A song of return. And a voice within himself begins to harmonise. It is the same voice from last night, though it is no longer twisted in fear, unable to face reality. It is his own voice. And now it is singing with the voices all about it, another refrain in the multitudinous ballad that is nonetheless composed around a singular theme. The music forms into words. Wake up, the world sings. Wake up. The snowflakes fall. He walks through them, and upwards, into the emptiness of the sky.